Data is getting bigger and bigger. Still only a minority of organizations succeeds in leveraging big data for new business models. 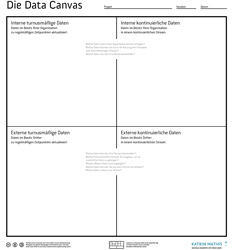 The Data Canvas consisting of a visual map together with trigger questions was developed to spark a structured discussion on available data in interdisciplinary teams. Used together with the Business Model Canvas and the Value Proposition Canvas, startups and established companies are empowered to innovate business models based on data.